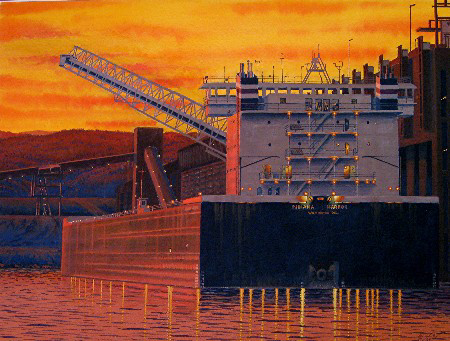 Against the background of a spectacular spring sunset, the 1000-foot M/V Indiana Harbor is loading about 69,000 tons of iron ore pellets at the CN/Missabe Railway Docks in Two Harbors, MN. The American Steamship Co.vessel has its 250 foot unloading boom swung to the portside, allowing the dock?s shuttles to load the aft cargo hatches. Upon completion of loading after nearly 8 hrs., the Indy will depart for Nanticoke, ON, 4 days away.